A type of work holder that uses adhesive instead of jaws or clamps is shown below and are described on other pages (e.g. 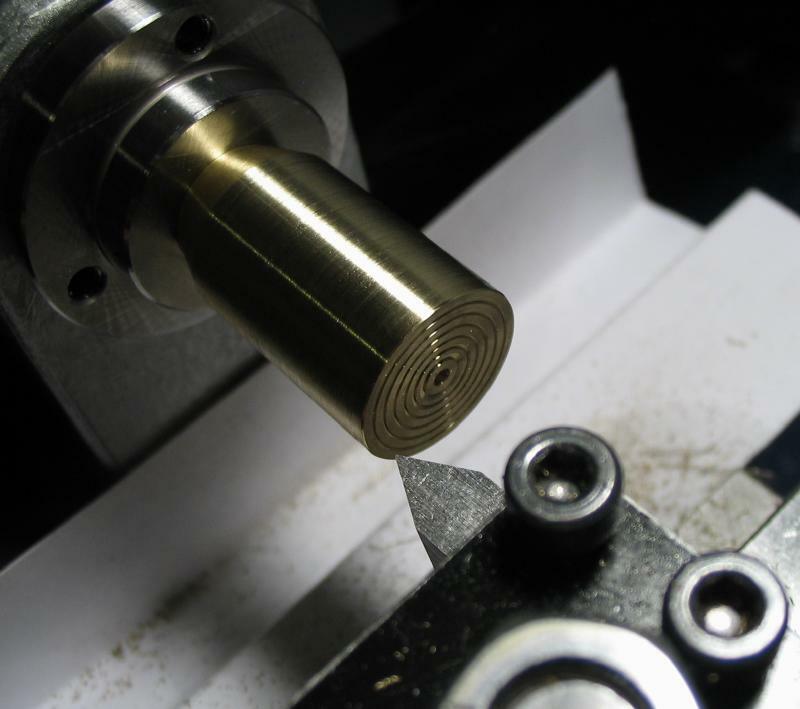 these are the same photos on the "other lathe-related stuff" page. 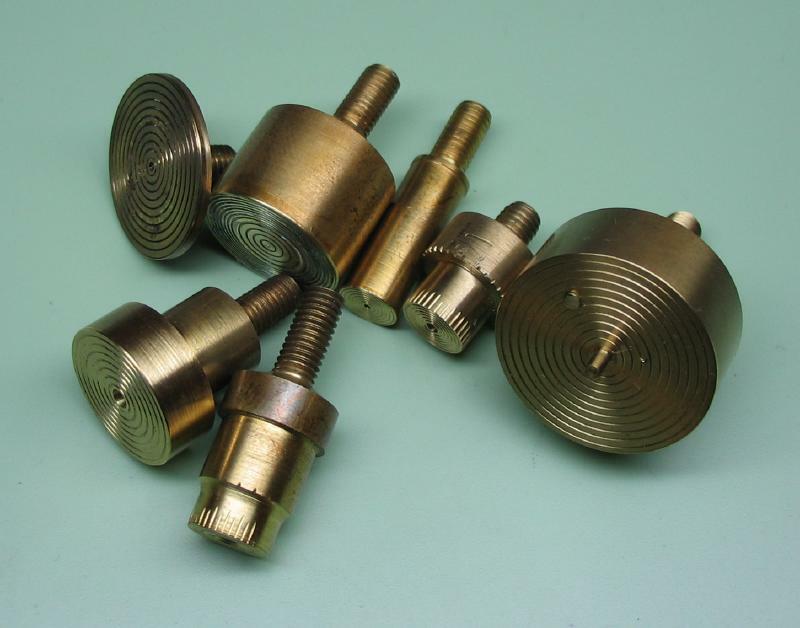 The set on the left was purchased second-hand, and does not have a maker's mark, but is likely somewhat recent vintage since it appears to have a B8 dimension collet-style shank and the threaded hole for the brass arbors is metric (M5x0.8). 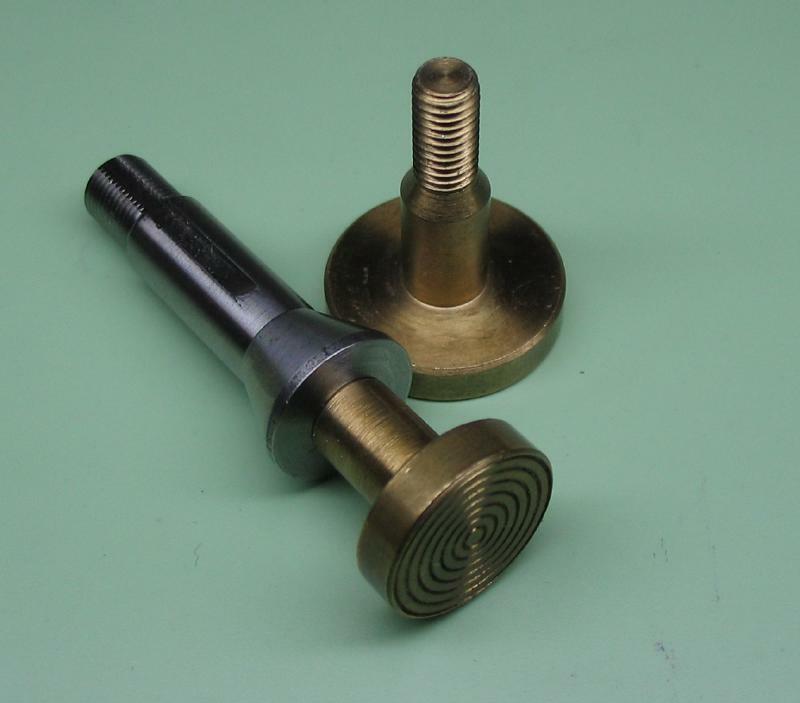 The work-holders can be easily made to the desired diameter and length from short lengths of brass rod. A collection of these arbors is shown on the right. They are reusable or modified as needed until exhausted. 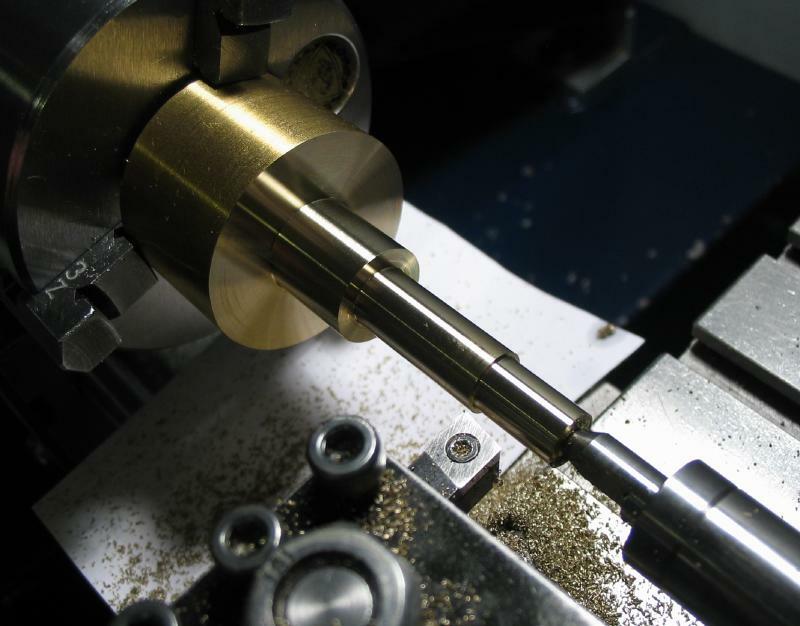 The principal of their use is that a trued and flat surface is provided onto which work can be adhered for then turning on the lathe. 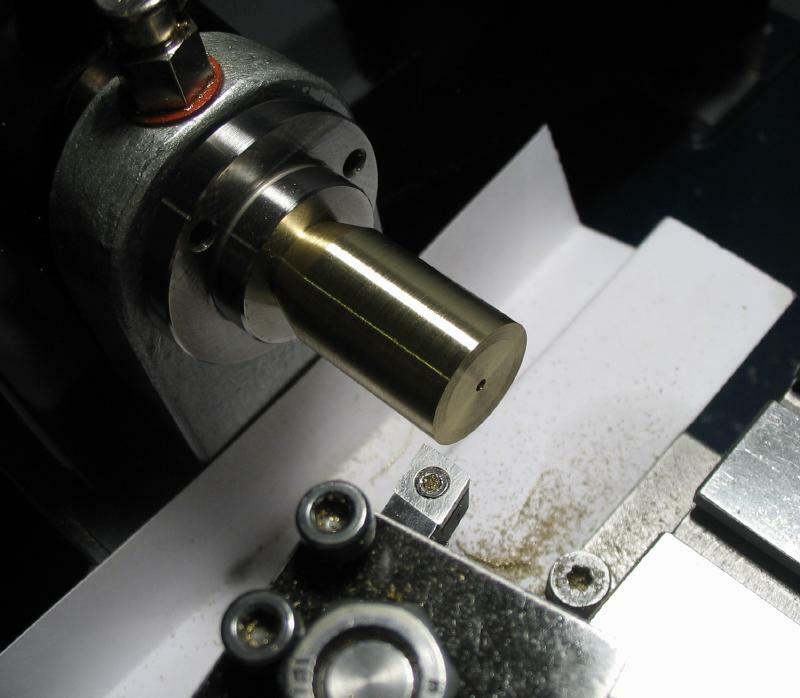 The grooves in the face of the arbors is where the adhesive ultimately resides; ideally, after applying adhesive to the chuck face, the flat face of the work is pressed into contact which drives the adhesive away except for in the grooves and thereby provide a fairly true-running setup. 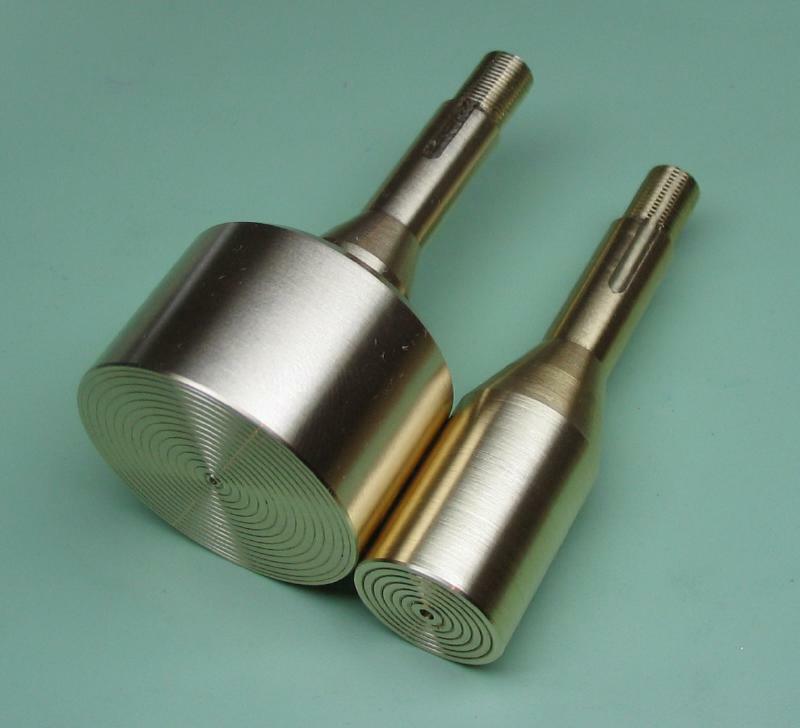 If willing to invest a few centimeters more brass rod and a bit more time, the brass can be machined to have it own collet-style shank. There's not much advantage to this except for larger sized chucks where the one-piece construction should provide some extra rigidity. 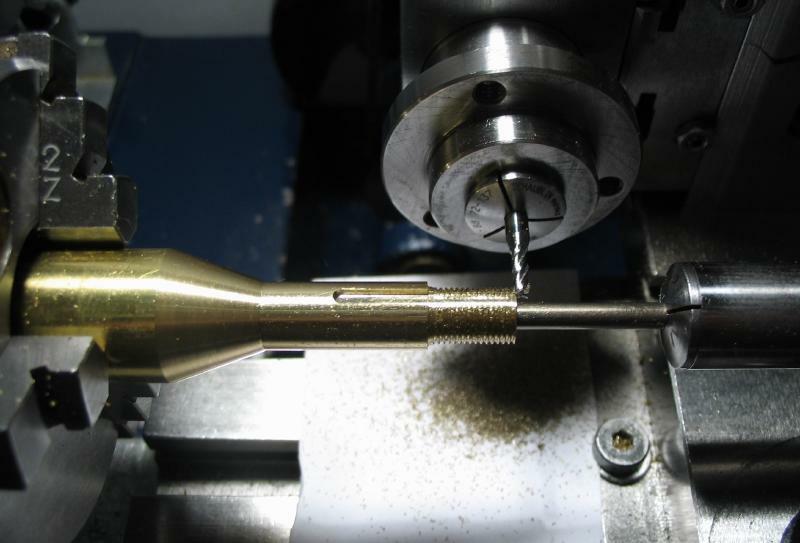 Machining the collet-shank is the most difficult step of this project, and the steps are summarized below. 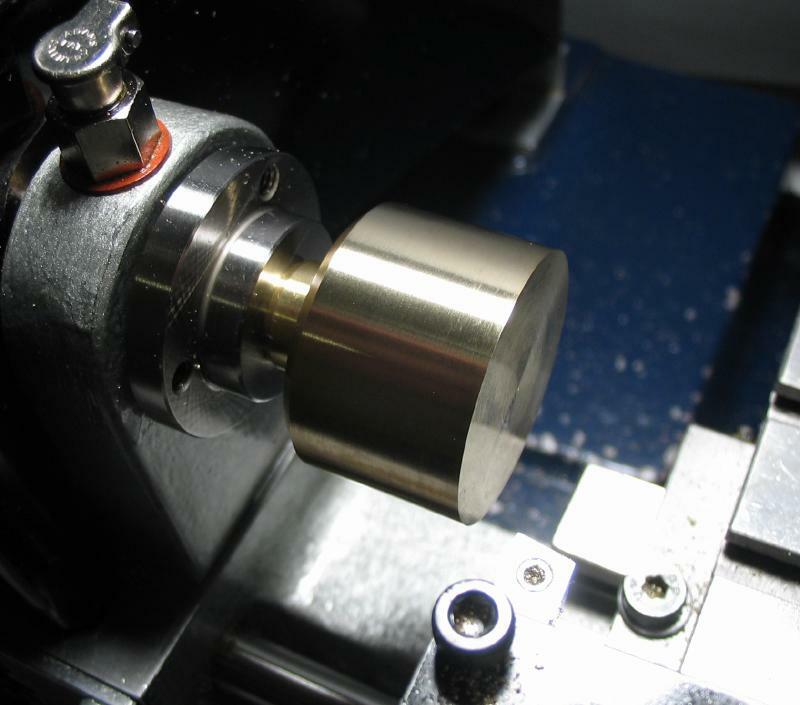 This first chuck was made from 5/8" brass rod, and was made with a wheel cutting project in mind. 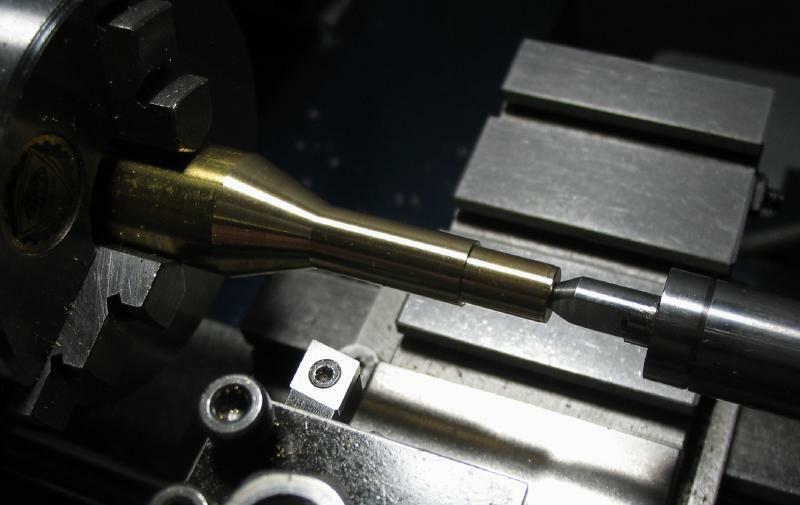 The rod is center drilled for tailstock support and the dimensions of a collet shank turned. 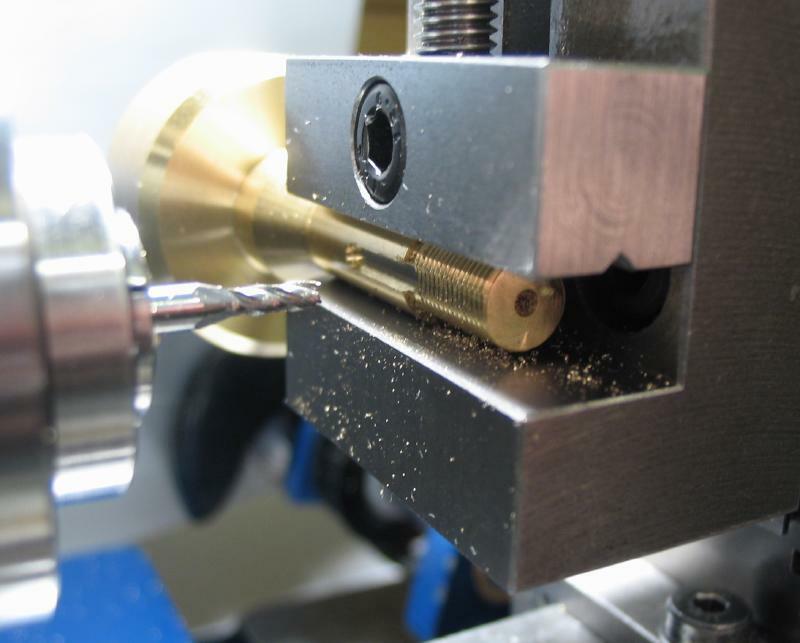 The threads were cut with a custom die, and the key way milled while still mounted in the headstock using the milling spindle. 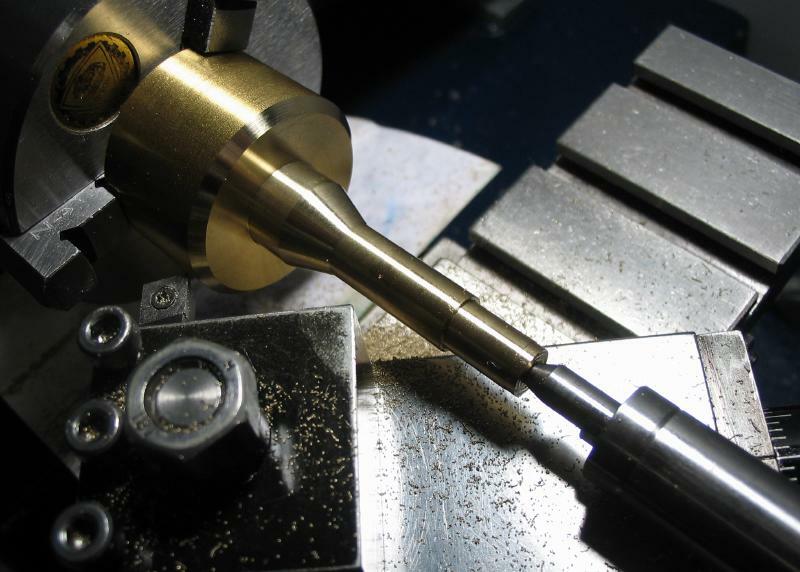 The work can then be mounted directly in the headstock and turned true. 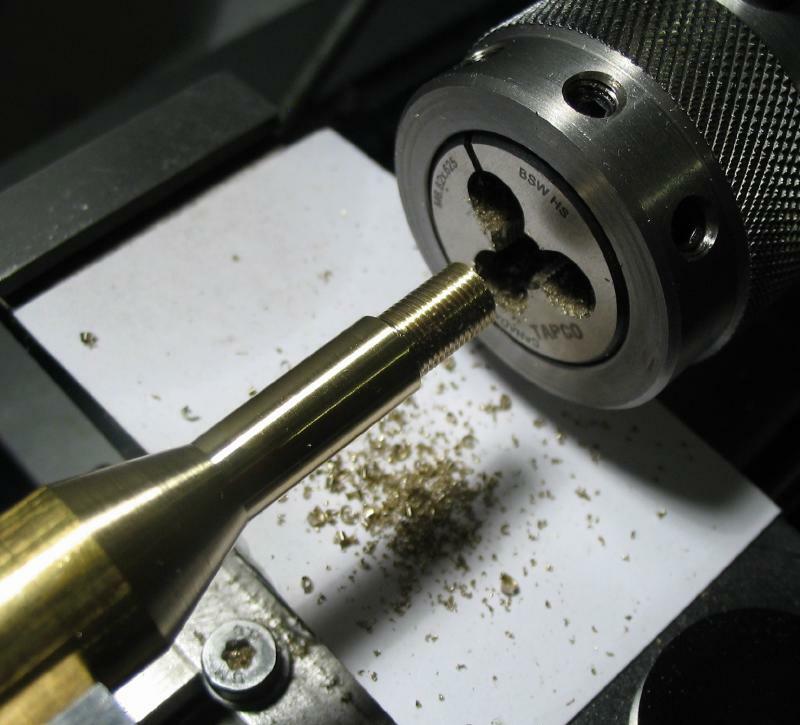 The end was faced, drilled, and then grooves turned using a 60 degree threading tool. 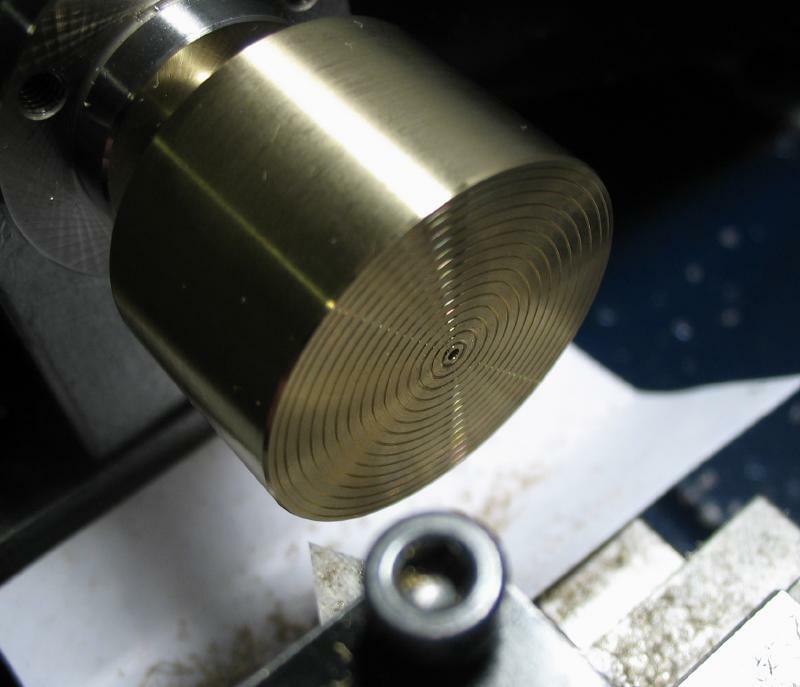 The geometry of the tool is not quite right for this, but the shallow cut (about 0.2mm) in free machining brass is very forgiving, and the exact shape of the groove is not critical. 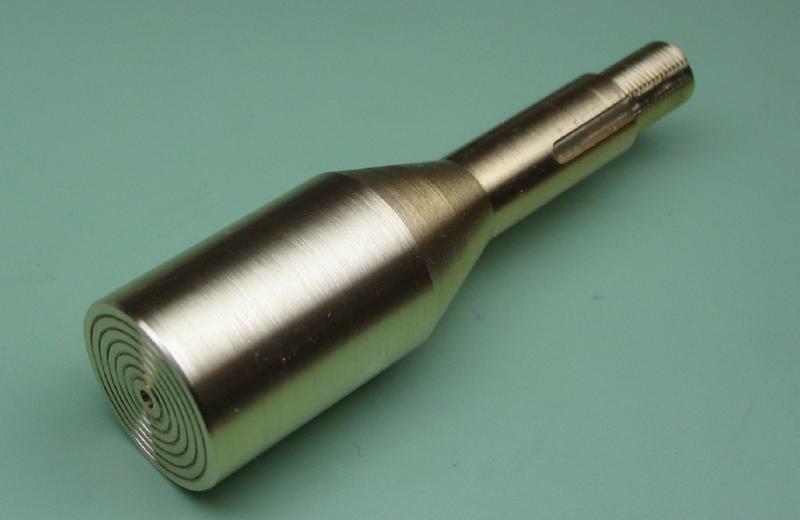 A jumbo sized version was made from 1.25" brass rod. 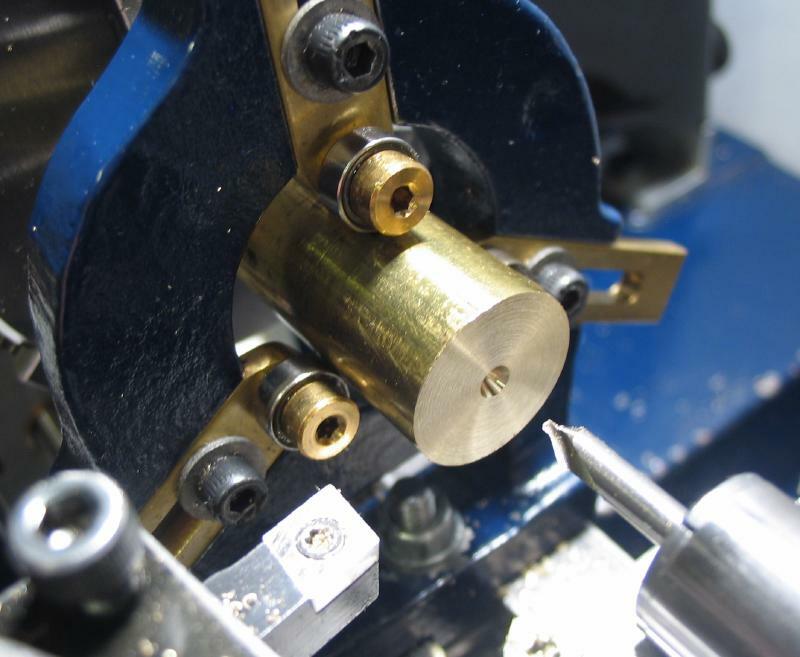 The process is the same, although quite a bit more turning is involved in producing the collet shank and needed to be mounted in the vise to mill the key way. 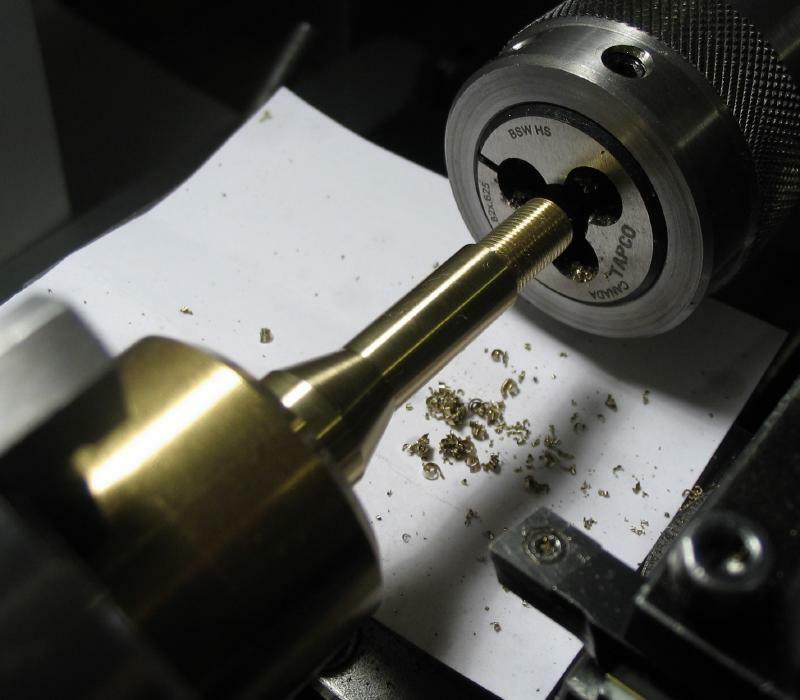 It was finished in the same manner, although a few more grooves, of course.